The Tartaruga Type Sport (TTS), designed by Tartaruga Entertainment Works in Japan, and produced by Pacific Cycles in Taiwan is a high-quality all-round bike designed to comfortably go anywhere. And, even though the bike doesn’t necessarily stand out in any single performance category, it does take some of the best features of other category leaders and blend them together in a bike that is better than the sum of its parts, and really is something special. I like to ride in comfort, whether it’s on a short trip to the market, or on an all-day-ride along rural roads. The TTS’s trailing link suspension fork design delivers excellent shock dampening for rough roads and sidewalks. The rear shock makes the ride, regardless of the road conditions, simply a joy. When riding along with a group of road cyclists, I found myself looking forward to the bumps as the TTS would smoothly glide over them, while everyone else was getting their bones rattled. Speed isn’t sacrificed for the sake of comfort with the TTS. The high-pressure 20” wheels have little rolling resistance and enabled me to easily cruise along at 25-30KM on my own and even faster when drafting in a group. I also like the multiple handle bar positions. For more relaxed rides, the bars can be positioned in an upright position. However, for more aggressive riding, the bars can be lowered and angled forward which provides a more aerodynamic riding position. There are two folding methods. The longer method takes around 5 minutes but results in a smaller fold. However, I don’t really like the bulky bag that is used for this method. I prefer the quicker fold which requires an adaptor to hold the front tire and handle bars in place. The quick fold only takes about 2 minutes and the cover used for this method can be rolled up into a bag the size of a small shoe. The size when folded is about 30-40 percent larger than a Brompton, however, the TTS can still easily be carried or rolled onto a train or stored at home or in the office. 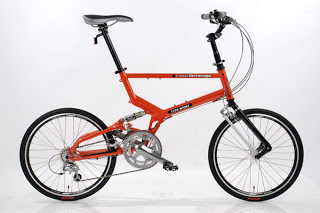 For someone who does a lot of city riding with multiple stops that require folding or storage, I probably would suggest one of the quicker folding bikes. Tartaruga Design Works provides several different accessories including racks, fenders, stands, rolling wheels (when folded), etc. I tried the rear rack with Ortlieb paniers. The rack and bags work well. However, if you have larger feet, you may need to position the bags at very rear-end of the rack so that your heels don’t hit the bags when pedaling. In terms of possible improvements for the TTS, I would suggest that the maker deliver the bike with higher quality pedals, or at least provide an option for a higher quality set up. The stock pedals are easy to flex during strenuous pedaling, and I’m not sure how long they will last under steady usage. Also, I noticed a couple of nicks on the frame’s paint after just a couple of rides. I am wondering if the company might want to experiment with more a more durable finishing as I have ridden other bikes for months and months without similar scratches appearing. All in all, I believe the TTS is one of the highest quality and most rider-friendly folding bikes on the market. If I had to draw a comparison with an automobile, I’d say that the TTS is cross between a Range Rover and Land Cruiser. It isn’t the fastest, smallest, lightest, or quickest folder on the market. However, it is a fast, relatively light bicycle, that can easily, comfortably, be ridden through city streets or on long cross country trips, and then be quickly folded, for easy storage or transport. Riding Position: Multiple positions available (from upright to aggressive) by use of the adjustable stem and handle bar positions. Accessories: Custom carry racks, folding packages with rollers and covers, etc.